Core aeration is one of the most important services to do to your lawn in order to keep it healthy. Traffic on your lawn (lawn mowers, children, pets) causes your soil to compact. This makes it difficult for the roots of your grass to grow and strengthen. 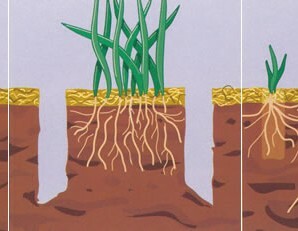 Core aeration helps loosen your soil, removes thatch, and helps your roots grow and receive benefitial water and fertilizer. A must for a healthy lawn.